Charleston, South Carolina, is one of the best food cities in the South and it's been getting a lot of national attention the last few years. Several Chefs and restaurants in town have been nominated for or earned prestigious James Beard Awards, including Chef Sean Brock of McCrady's and Husk, named the Best Restaurant in America 2011 by Bon Appetit magazine. As a freelance writer, restaurant reviewer and self-admitted food nerd, eating at both of these restaurants was on the required list for any trip to Charleston. Reservations are hard to get, but we found a mutual friend who managed to squeeze us in for a prime seating on a Friday Night. Husk is tucked away on a side street in a beautifully outfitted 19th century home. The dining rooms and kitchen occupy the main house and The Bar at Husk is across the driveway in the old carriage house. That was our first stop. I won't call the folks who work the bar at Husk bartenders because they're far more than that. These guys are mad scientists, wizards, artists. What they do with cocktails is amazing. 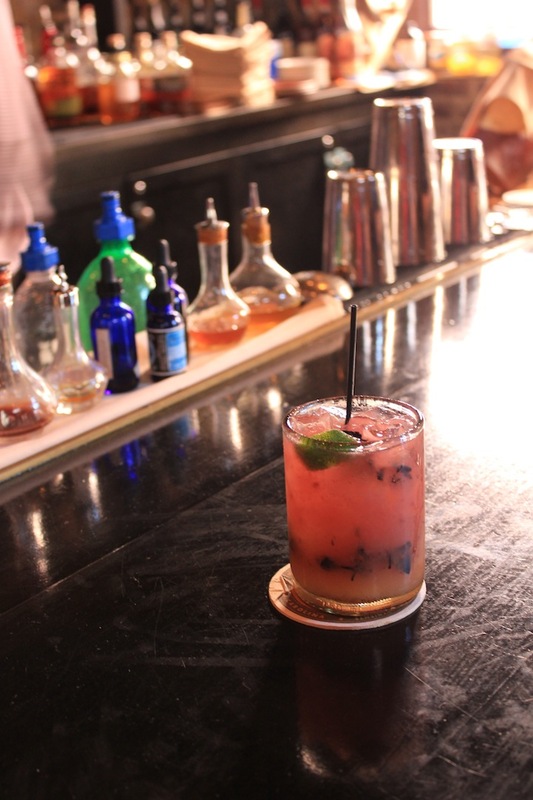 They infuse and macerate their own alcohol in house, make their own bitters and tinctures, and create some of the best drinks in the city. Lauren ordered a Milan Muleberry - basil and cracked pepper vodka, summer berries and ginger beer - which was cool, sweet, herbacious and refreshing in the early summer heat, and I got an Old Fashioned. We took our time waiting for our table talking to the mixologists behind the bar. 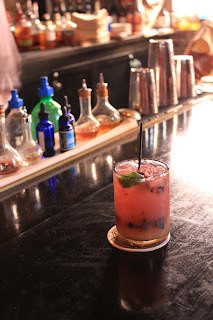 The Milan Muleberry at The Bar at Husk. Old Fashioned, Don Draper's drink of choice. Once seated for dinner, we were both in awe at Chef Brock's ambitious menu. Not only does he source everything from South of the Mason-Dixon Line, he cooks traditional Southern cuisine with a menu that changes every day to reflect what's fresh, in season and delicious. Sure, some things stay on the menu throughout the season, like the heirloom tomato salad, with minor twists, but that many changes present a challenge to the kitchen brigade. We decided to order two starters, split an entree and get a side of cornbread (and two more cocktails and dessert, but all in good time). I'm an adventurous eater and Lauren is too, but it took me a minute to talk her into the Buffalo Pig Ear Lettuce Wraps. Not so long to talk her into the Virginia Scallops and Slow Cooked Pork Belly with sweet corn, heirloom eggplants and smoked tomatoes. Dragoon's Punch (left) and The Copperhead (right). The pig ear dish is a great example of how Chef Brock puts a twist on traditional Southern food. To Lauren's delight, pig ears taste like bacon, especially when fried crispy. And to her delight (and mine), the Buffalo sauce was perfect (and she should know, she went to school in upstate New York). Every bite of the lettuce wraps included the perfect balance of the rich, smoky pig ear, the tangy Buffalo sauce, the tart pickled red cabbage and the sweet orange. It crunched, it crackled and tasted a bit like heaven. Our cocktails needed refreshed, so we ordered a Charleston Light Dragoon's Punch and a Copperhead. Lauren's Punch was excellent - Black tea gives it an earthy smell and flavor, and raw sugar cuts the alcohol and bitterness of the tea to make for a drink I wish I could recreate. My Copperhead - Absente (a sister to Absinthe), fresh lemon juice, a muddled sugar cube and wormwood bitters - was strong and heady. A Buffalo Pig Ear Lettuce Wrap meets its fate. The Virginia Scallops and Slow Cooked Pork Belly was next up on the table and man, was it good. As if a perfectly seared pair of scallops on a textbook slab of pork belly wasn't enough, the dish had smoked tomato and corn relish, sweet corn puree and heirloom eggplants. Wow. What's better than pork belly, scallops and a sweet corn puree? scallop? They brought a bit of brightness to the dish. Our entree, Almaco Jack, Charleston Gold Rice "Risotto," Grilled Spring Courgettes (squash) and Marinated Heirloom Tomatoes, came to us split onto two plates, and, given the size of the appetizers, the portions were perfect. rice fields and rice plantations dominated the land. The fish was flaky and seared to near perfection, and the "risotto" added a rich, creamy note to each forkful. Add to that the smoky-sweet heirloom tomatoes and you have a winning dish. Like Granny used to make, but smaller. For dessert, we chose a peach cobbler with oatmeal crust and brown butter ice cream. Peaches are a favorite around our house, but sometimes good ones are hard to get. Evidently not if you're Husk. These peaches were primo. And the brown butter ice cream? Come on? It's two great things - brown butter and ice cream - how could it be bad? Brown butter ice cream? Get out of town. Throughout the meal - from cocktails to dessert - Husk delivered on the Bon Appetit award's promise and shot to the top of my list of favorite restaurants. A historic home; a Chef with the fortitude and creativity to stick to local, traditional food; killer cocktails and fantastic service all made Husk a must-dine restaurant in Charleston.